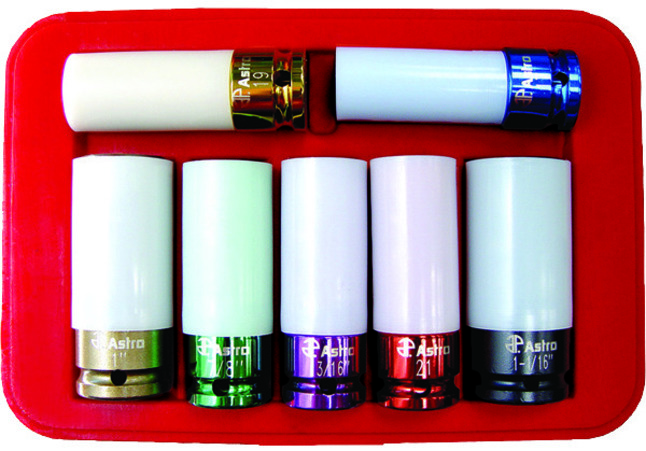 Astro 7 Piece Impact Socket Set with chrome protective plastic sleeve and shallow broach, includes sockets sized 13/16 in, 7/8 in, 1 in, 1-1/16 in, 17 mm, 19 mm and 21 mm. This set comes in a blow molded case measuring 10-1/4 in x 6-1/4 in x 1-3/4 in for storage as well as transport ease. Set features protective sleeves as well as internal plastic inserts to resist scratching of wheels or decorative lug nuts. Sockets have a hollow design that creates room for removing longer bolts by pushing out the plastic insert. Sold as 7 of set.